I'm a life-long naturalist and citizen scientist with a deep and abiding curiosity about the natural world. Butterflies are among the best-known and most commonly seen insects world-wide. Some butterflies, however, are quite rare. This guide features butterflies that most of us will never see in real life. From the spectacular Bhutan Glory to the gold-plated Ornithoptera croesus, these are insects that exist in small numbers in exotic places—and in some cases are just barely hanging on to survival. Some are strikingly beautiful; others are average-looking insects that might fly right past you without you even noticing. Many of the insects on this list can be found in the CITES listing of critically endangered animals. 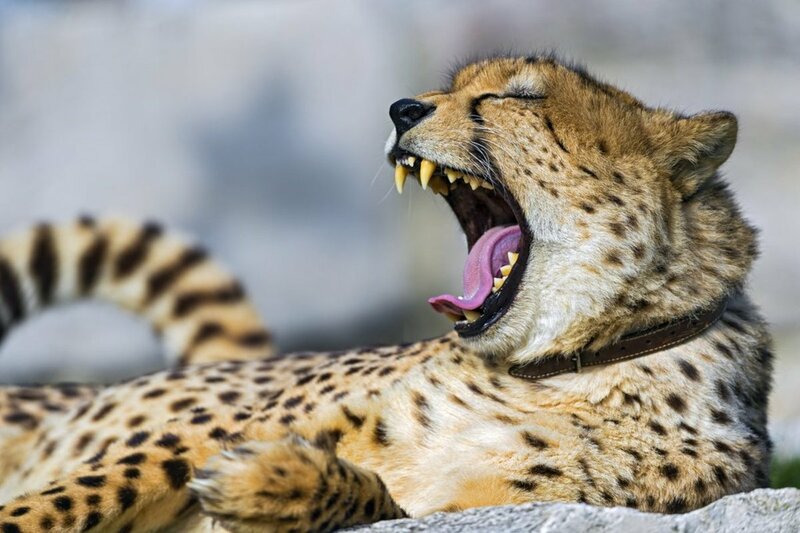 CITES stands for Convention on International Trade in Endangered Species, and the word "trade" in that name points to a disturbing reality: some humans will catch, kill, and transport critically endangered animals in order to make a few dollars. When people tell you that the most dangerous animal on earth is Man, this is what they're talking about. One way CITES works is this: if you are an American citizen and you break a wildlife law in, for example, Paraguay, then you can be prosecuted in a US federal court and penalized for breaking that law. In other words, it makes every country's wildlife laws just as valid as any other's. There have been many objections to this arrangement, but the essence of the agreement still stands. Most of the butterflies here, being protected by CITES, are therefore protected worldwide. This protection can extend to their habitats, preventing humans from building on or developing land that the insects depend on for survival of the species. It's a hopeful sign that the people of the world can get together and agree that some things are worth saving. If we let money and profit rule everything, soon, all we will have is money and profit. Butterflies are insects in the order Lepidoptera. 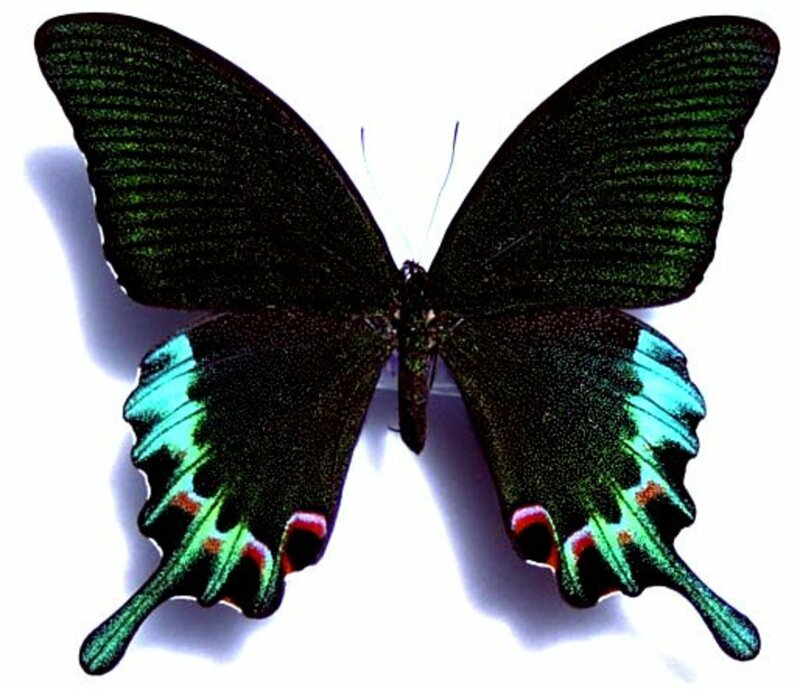 They have four wings and six legs, and they all undergo what is known as "complete metamorphosis." That means that in the course of the individual butterfly's life it goes through four distinct stages: egg, caterpillar, pupa, and adult. Adult butterflies emerge from the pupa as soft, wrinkled beings that are unable to fly or defend themselves in any way, so it's essential that they expand their wings as soon as possible. Immediately on emerging from the pupa (also called a "chrysalis"), the insect begins pumping haemolymph—the insect equivalent of blood—through the veins in its wings. The wings expand, harden, and the insect can fly within an hour or so of hatching. 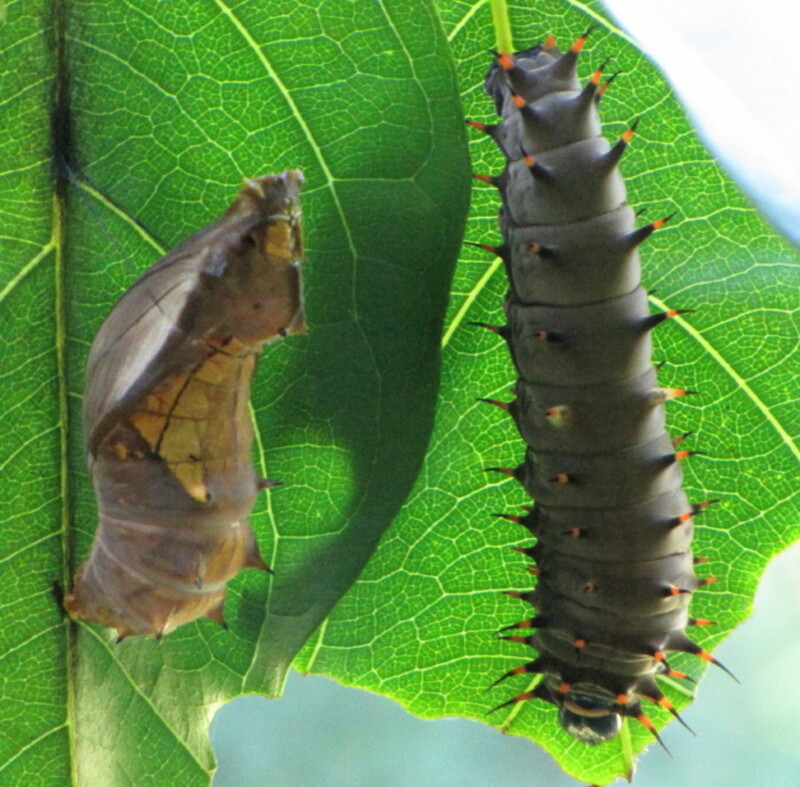 The function of the caterpillar, or larva, is to eat and store fat for the change into an adult; the function of the adult is to find a mate and reproduce so the species can continue. All of the world's butterflies' colors, beautiful though they are, are first and foremost an evolving form of either camouflage, mimicry, or warning colors. Some are considered beautiful by humans, but that's only a by-product of the deadly serious battle for survival in which each and every butterfly you see must engage. This insect, also known as the Ceylon Rose, is native to a restricted area of Sri Lanka. CITES listed it as "critically endangered" at the request of the Sri Lankan government due to the continuing loss of the animal's habitat. This is a common refrain when it comes to endangered animals, especially insect: loss of habitat caused by man-made intrusions leads to the animal having nowhere to live, and nothing to eat. The result can be the loss of the entire species if steps aren't taken to preserve at least some of the original habitat. 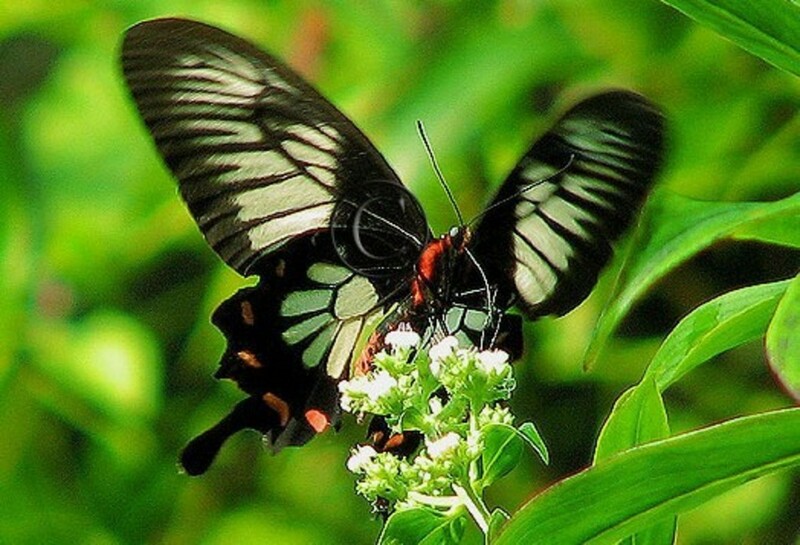 The Ceylon Rose is a beautiful swallowtail butterfly. There are many kinds of swallowtail butterflies throughout the world, and most of them are common, or at least not on endangered lists. One of the more familiar swallowtails in North America is Pterourus glaucus, the tiger swallowtail. 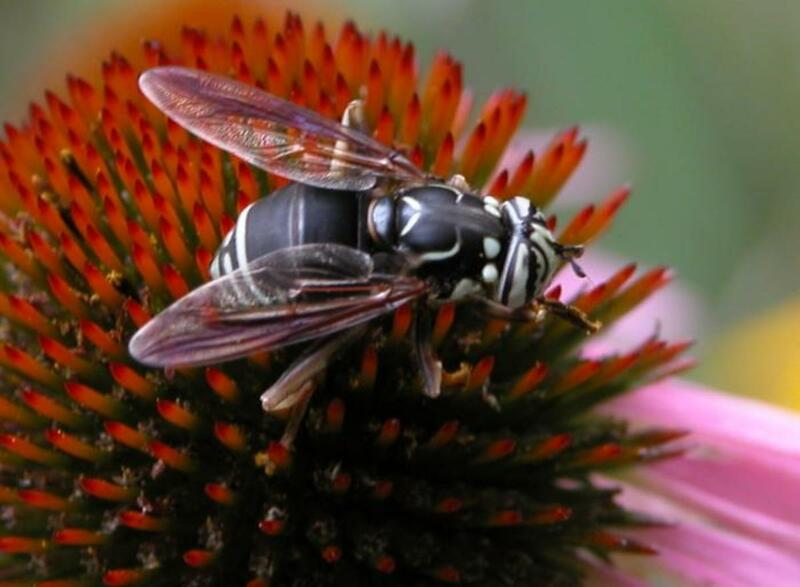 It's a big, beautiful species with black tiger stripes on its deep yellow wings. It's well-established and common over most of its range. 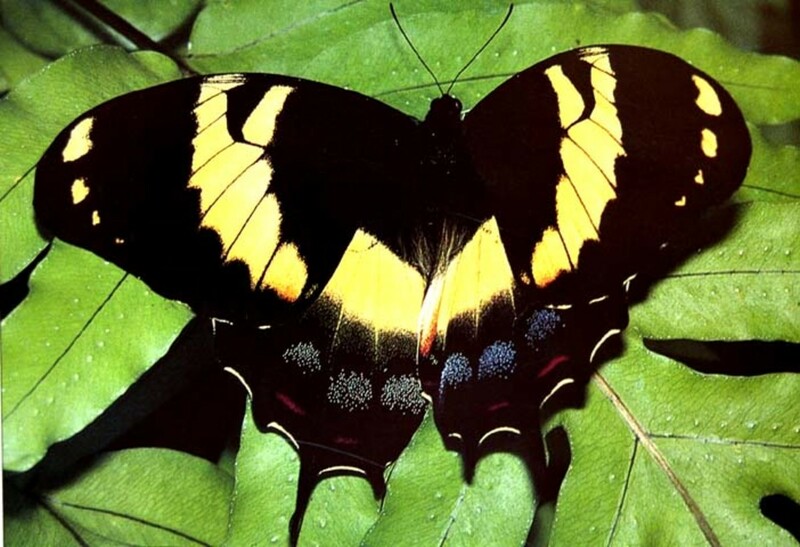 There are several other swallowtail species in the US. 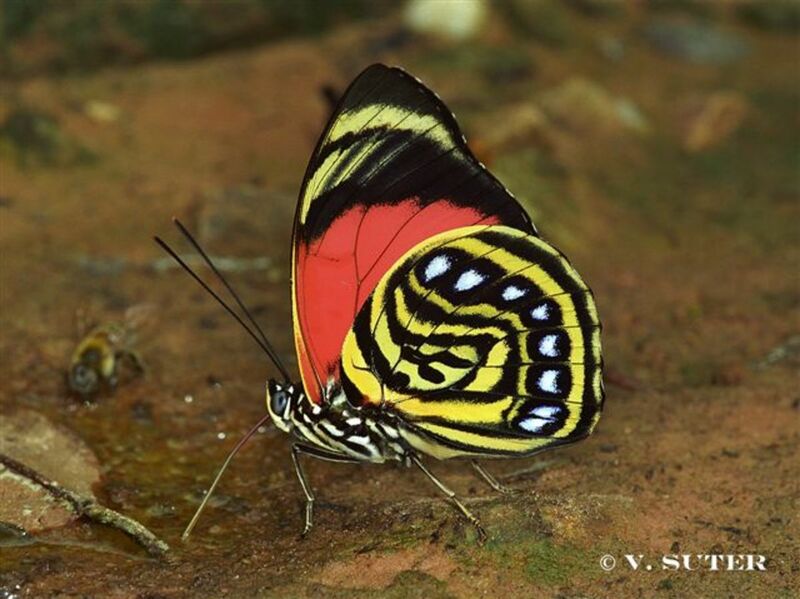 This butterfly is generally limited to lowland rain forests in the vicinity of Kithulgala, Sinharaja, Kanneliya and the Rathnapura District of Sri Lanka. It also occurs in the Sinharaja Biosphere Reserve, and in that area is protected from habitat destruction. Still, collecting specimens of the Ceylon Rose is a crime in Sri Lanka, and because of the insect's CITES listing, it is considered a federal crime in the US (even though the butterfly occurs nowhere near the continent!). Ironically, listing an animal as protected by CITES draws the attention of people who deal in the sale of dead specimens of rare insects. There are some who object to the listing of the Ceylon Rose and other insects for this very reason. Within its restricted distribution, P. jophon can be found in tropical rainforest habitat at medium elevations up to 2000 feet, flying with a slow, gliding flight in the morning or afternoon. It visits flowers in light gaps and at the forest edge, as well as along roads. Like other tropical butterflies, when not on the wing it is resting among foliage deep in the forest, where it can be nearly impossible to find. The caterpillar of the Ceylon Rose is a beautiful purple-black with fleshy crimson processes on its back. It cannot sting but may be protected by poisonous compounds in its foodplants, which are in the Aristolochia genus and are known to contain toxic alkaloids. There are many other swallowtail species that feed on this group of vines, and they have similar bright colors and a slow flapping flight -- all signs that a butterfly does't have too much to worry about from predators, who likely recognize the insect as distasteful. The genus Agrias includes many species, many of them relatively common. Agrias amydon is fairly typical of this group in that the nominate species has been broken up into many subspecies, many of them named for the area in which they occur. In the case of Agrias amydon boliviensis, it's the version found in Bolivia that has been deemed rare enough to qualify for CITES protection. 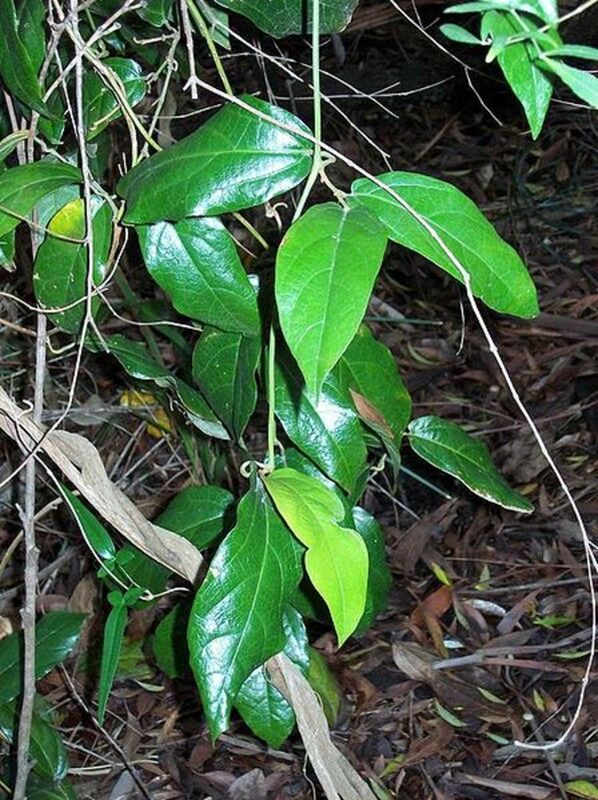 This subspecies of A. amydon, out of more than twenty, is considered critically endangered. So what exactly IS a subspecies? It's actually a very good question. Technically, it means two animals that are closely related, and could interbreed if they weren't separated by geography. 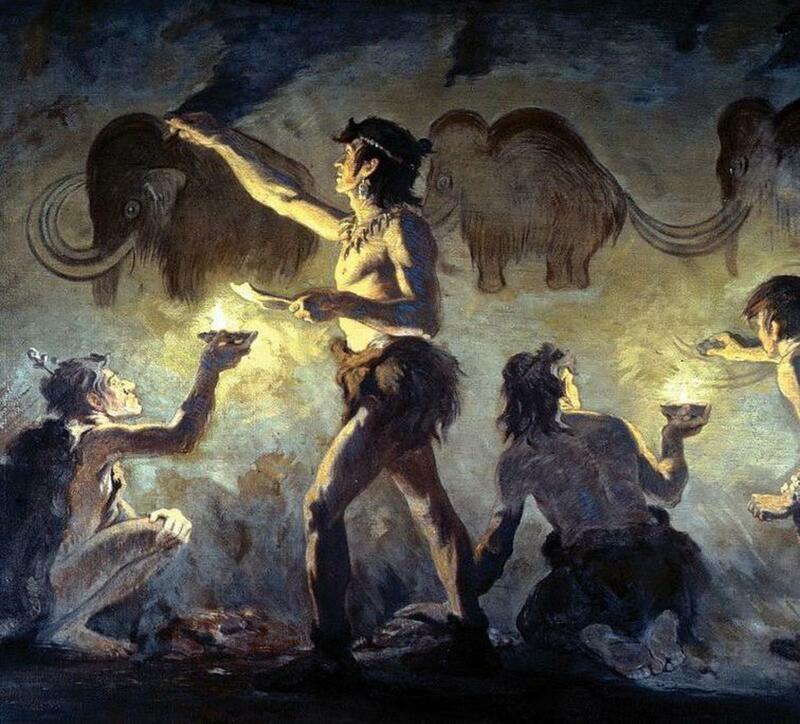 But looked at another way, in many cases the concept of "subspecies" may be thought of as science's attempt to take a snapshot of the ongoing process of speciation -- that is, a moment in the process of evolution as one species becomes two and so on. A. amydon could be splitting up into what will many years from now be considered legitimate separate species. Agrias amydon: a case of cryptic coloring? "Cryptic coloring" simply means color and design meant to blend in with the surroundings. 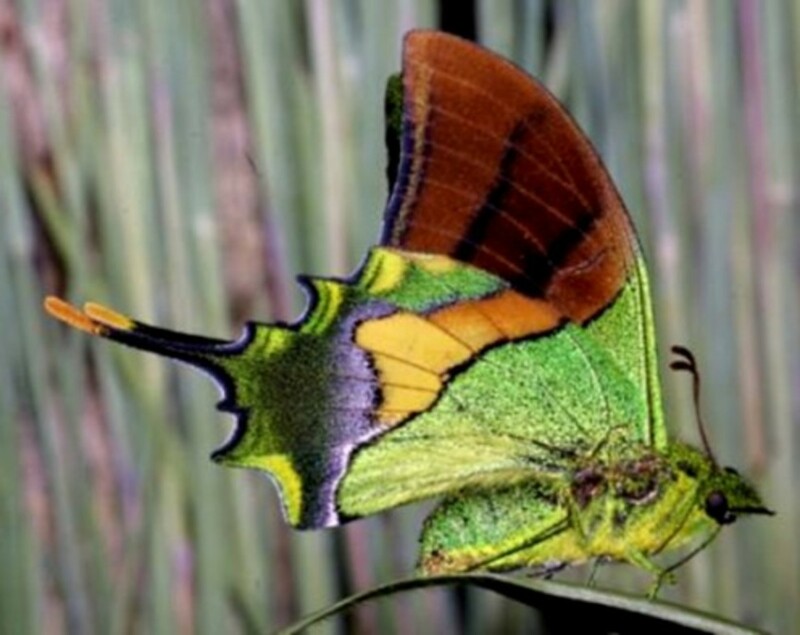 Looking at this brilliant and showy butterfly, it may seem strange to think that it could be an example of camouflage. 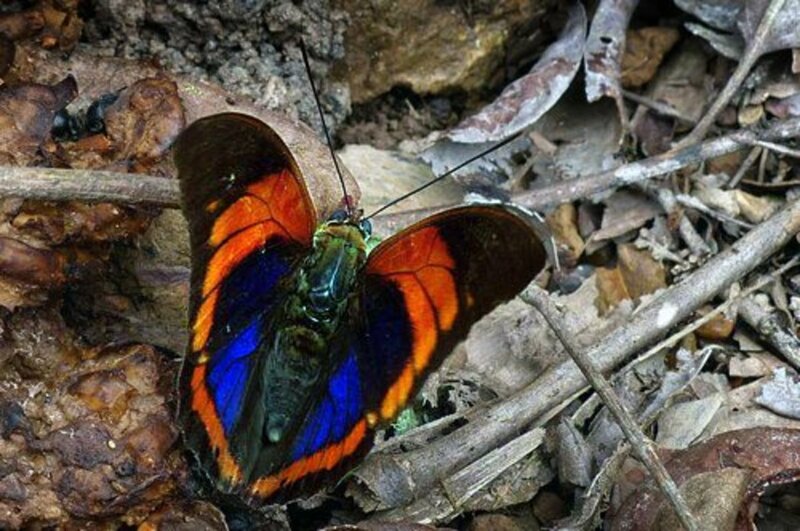 But entomologists (including Philip J. DeVries who literally wrote the book on Costa Rican butterflies), have pointed out that the bright reds and blues of similar butterflies vanish when the insect lands and folds its wings, leaving only the convoluted pattern of the underside. The sudden change can make it appear as off the insect has simply vanished into the forest. The design of the underside actually blends in quite well with the surrounding complexities of leaf, branch and vine, and that makes the butterfly hard to see. The "flash and hide" mechanism is similar to a group of North American moths known collectively as the "underwings" (genus Catocala). These moths reverse the under-upperside of the Agrias butterfly, but the effect is the same -- they hide bright banded hind wings under bark-colored uppers. Resting on a tree they're nearly invisible, but when disturbed they fly and the bright colors are revealed. Then the insect abruptly lands and covers those showy hind wings. The effect is startling; it's really as if the insect has suddenly vanished into thin air. Morpho butterflies are known world-wide for their spectacular reflective blue wings and their great size. To see one flapping through the rainforest is a profound moment. They include some of the largest and most visible of all insects, and in some ways have come to symbolize the rainforest itself: exotic, unattainable, wild, and beautiful. It's sometimes hard to remember, when you happen to see one with its characteristic bouncing flight, reflecting the blue of the sky with electric brilliance, that the colors are, like any other wild animal's, part of a survival tactic shaped by eons of natural selection. But that's the beauty and profundity of science: when you seek your explanations in the natural world based on observations and testable ideas, reasons and processes open up their deeply complex and deeply moving secrets. Like the Agrias species above, Morphos use their colors to confuse predators. The bright blue is hidden when they land, and underneath (as you can see in the video below) they are perfectly camouflaged with dark browns, and also protected by the appearance of threatening eyespots. Watch Spectacular Morpho Butterflies Hatching! 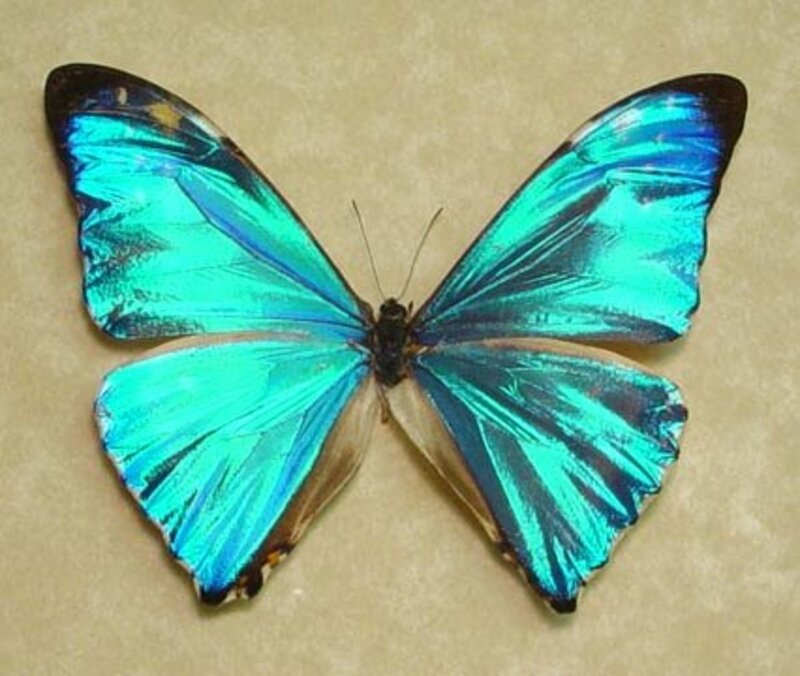 It's a shame, but Morphos are often targeted by collectors who happily buy and sell the dead specimens. For many, their interest is not scientific but purely aesthetic, and often the specimens they buy have no scientific labels attached that would tell where and when the animal was collected, which would lend it at least a little scientific value. Collecting insects as part of a scientific study, and keeping careful records that will be of use to researchers studying the insects down the road, is a vital and time-honored activity. But even this research is coming under fire from well-meaning but misguided lovers of wildlife. Killing a small number of individual insects as part of study has little to no impact on populations, even when it comes to rare species. Destruction of their habitat, however, can and has caused entire species to become extinct (see the Xerxes blue in the western US, for example). 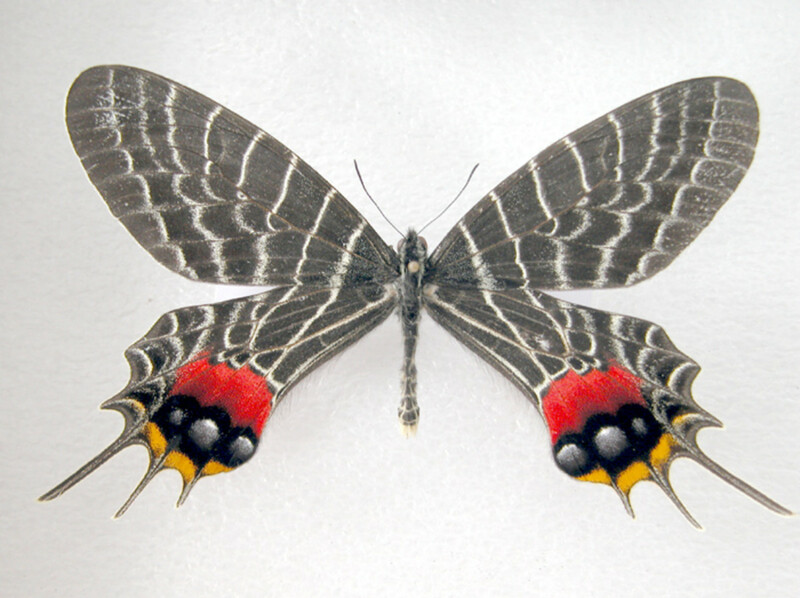 This amazing insect, also know as the Bhutan Glory, is a member of the swallowtail family. Those beautiful hindwing tails are typical of many members of the group, although the Bhutan Glory is considerably more exotic-looking than most swallowtails. It's thought that the bright, flapping hind wings draw the attention of predators, leading them to strike at the tails. The butterfly can survive quite well without the ends of its wings -- if the predator grabbed the insect by the head or body, the outcome would be quite different. The Bhutan Glory isn't too hard to find in its habitat -- it's just that the habitat it lives in is hard to access. The government wants to protect this insect partly for fear that it will become victimized by collectors trying to profit from its beauty. That may be true -- but collecting has never been definitively shown to have caused the extinction of a butterfly (and there was a study that attempted to do just that, and failed). In any case, Bhutanitis lidderdalii is a CITES listed species, and woe unto the collector who tries to catch one! This is a really cool little video of a Bhutan Glory nectaring in its native habitat. 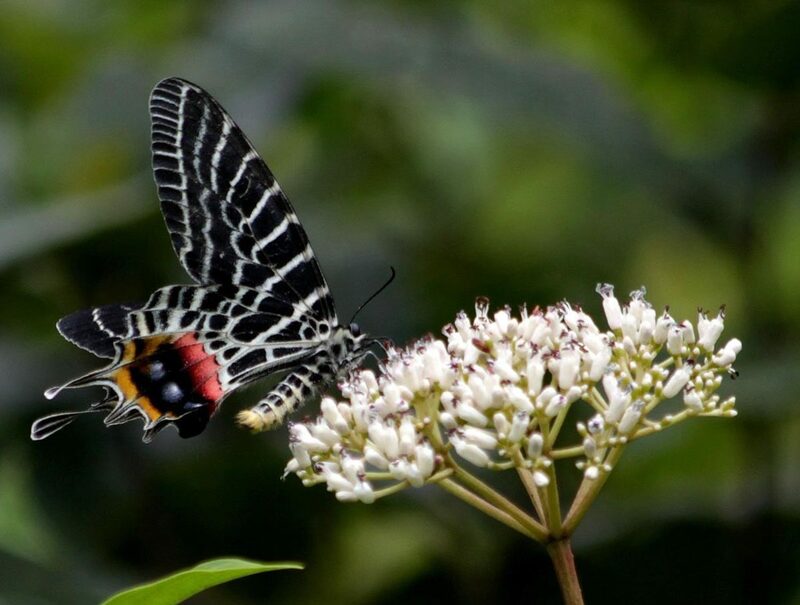 It includes a bit of local flavor, too -- I like the way it gives you an idea of what it's like to travel to southeast Asia and then just come across one of the world's most beautiful and unattainable butterflies fluttering around a patch of flowers. Prepona praeneste ssp. buckleyana is so rare that it's nearly impossible to find images of it on the internet. Like many rare or endangered butterflies, this animal is a subspecies of a kind of butterfly that isn't particularly rare, or has enough other variants as to make it fairly well-known. Prepona praeneste is the nominate, or main species, and buckleyana is the subspecies. Prepona is a genus name, a little like person's last name, and the species name, praeneste, can be thought of as a first name. So there are several kinds of butterflies with the genus (last) name Prepona, but only one kind has the specific (first) name praeneste. Now it gets a little tricky. 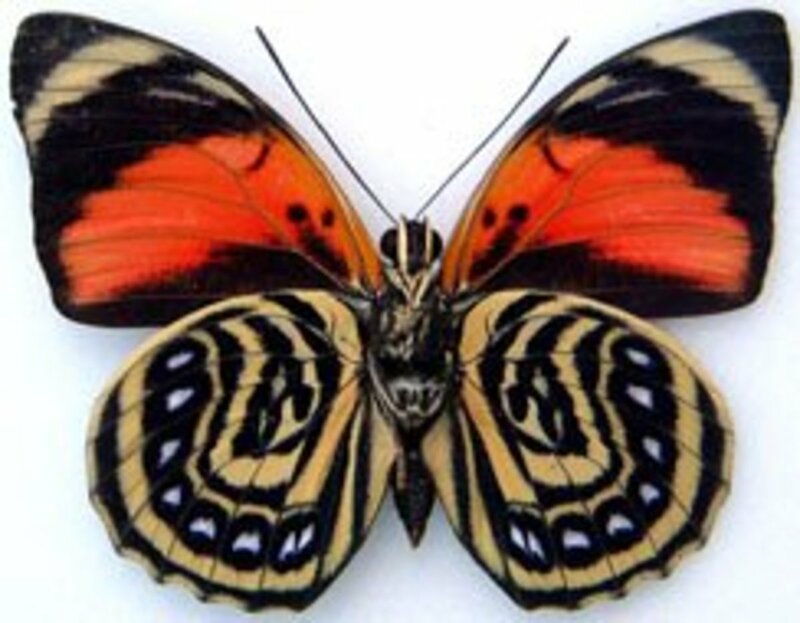 Several genuses can be gathered together in one tribe or subfamily; in the case of this butterfly, the subfamily is Charaxinae, and there are several genuses in it, including Prepona. These are often brightly colored and stout-bodied. Stepping back to another level, the subfamily Charaxinae belongs, along with many other subfamilies, in the family Nymphalidae. The Nymphalidae are a major group of butterflies, and include many subfamilies and many, many different species. So while Prepona praeneste ssp. buckleyana belongs in the Nymphalidae family, it has a lot of company. 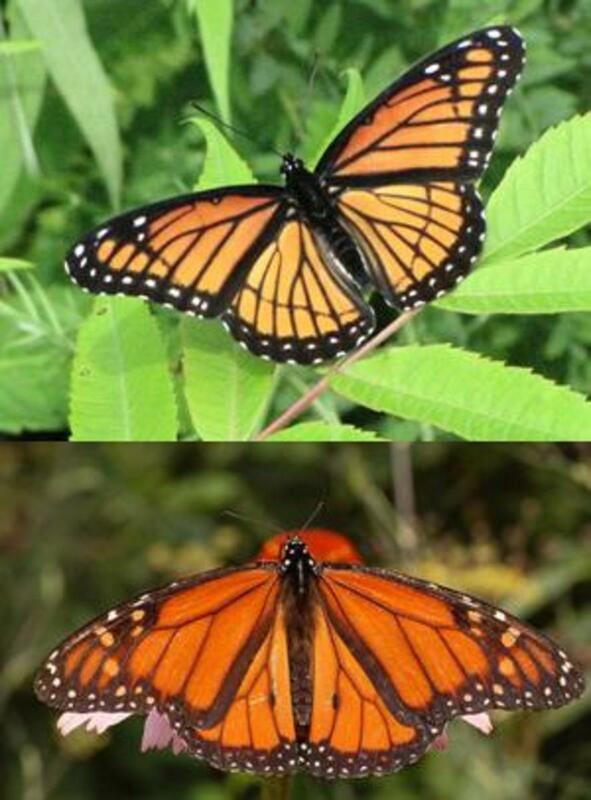 For example, the common Monarch is often placed in the family Nymphalidae -- see how different they are? Basically like distant cousins. But still related to each other! The birdwing butterflies (genus Ornithoptera, meaning, literally, "bird wing"), are a distinct group of swallowtails (family Papilionidae) that occur exclusively in New Guinea, Australia, and the surrounding region. They are famous worldwide for their stunning colors and large size, and many of the dozens of subspecies are rabidly sought after by collectors. In their natural habitat, the Ornithopterans fly powerfully through rainforest and secondary growth habitat, seeking mates and food plants on which to lay their eggs. Like other swallowtails, the plant their caterpillars eat contains toxins, and therefore it's thought that the caterpillars as well as the adults are protected from predators. 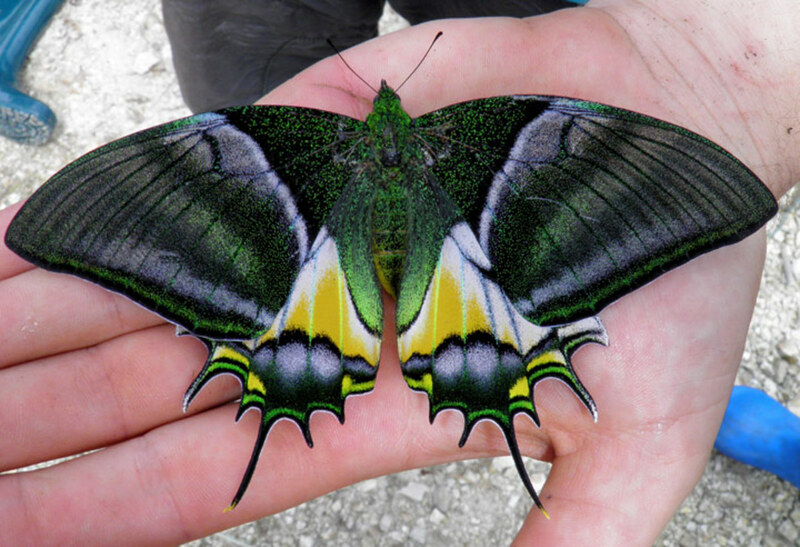 Ornithoptera chimaera is in many ways a typical birdwing, with the male stunning in its shimmering green/blue colors and a body marked with tufts of red "fur," and the female huge but less beautifully colored. It's clear from the form of the caterpillar and pupa of these huge butterflies (above) that they belong with the swallowtails. Both are nearly identical to many of the species that occur in North America, such as the pipeline swallowtail (Battus philenor). Like that species, the bird wings feed vines in or near the Aristolochia genus. The fact that related species are spread throughout the world is a rich source of research for scientists who study the distribution of animals. Papilio chikae is also known as the Luzon Peacock Swallowtail. It's a large insect, with lovely iridescent lunules around the margin of each hind wing. It flies in restricted areas of the Philippines, where it frequents mountain peaks and ridges around Baguio City and the Bontoc area. There are two forms—a spring form and a summer form—and both are highly sought after by butterfly collectors around the world. There are other species that look very much like P. chikae, but collectors focus on this species in large part because of its rarity. For this reason, CITES has listed the butterfly as critically endangered and anyone possessing the insect is at risk of being prosecuted, and even serving jail time. The understandable urge to protect that which is beautiful, rare, and vulnerable has led to very restrictive laws on collecting some species. This may seem to be common sense, but unfortunately, in some cases, the outcome is a damper on any form of work with rare insects, including legitimate scientific research that would necessitate killing or removing individuals from they habitat. In addition, the question of whether collectors could do anywhere near as much damage as habitat loss remains a good one. You can take some individuals out of a population, but take away food and shelter and you may destroy the entire population. How Do Butterflies Really Become Endangered? 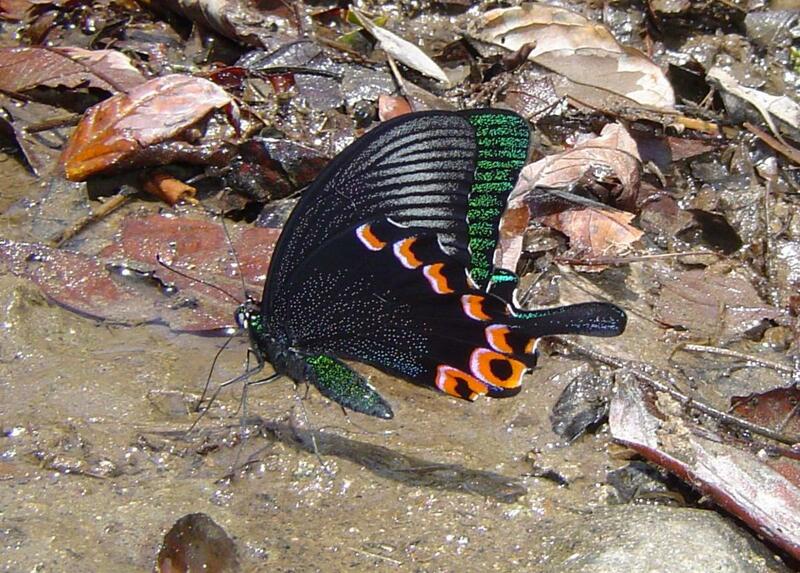 Adding to the rarity of the Luzon Peacock Swallowtail is the fact that they are limited by food plant and other preferences to a very band of altitude in the mountainous areas in the Cordillera Central mountain range of Luzon, Philippines. 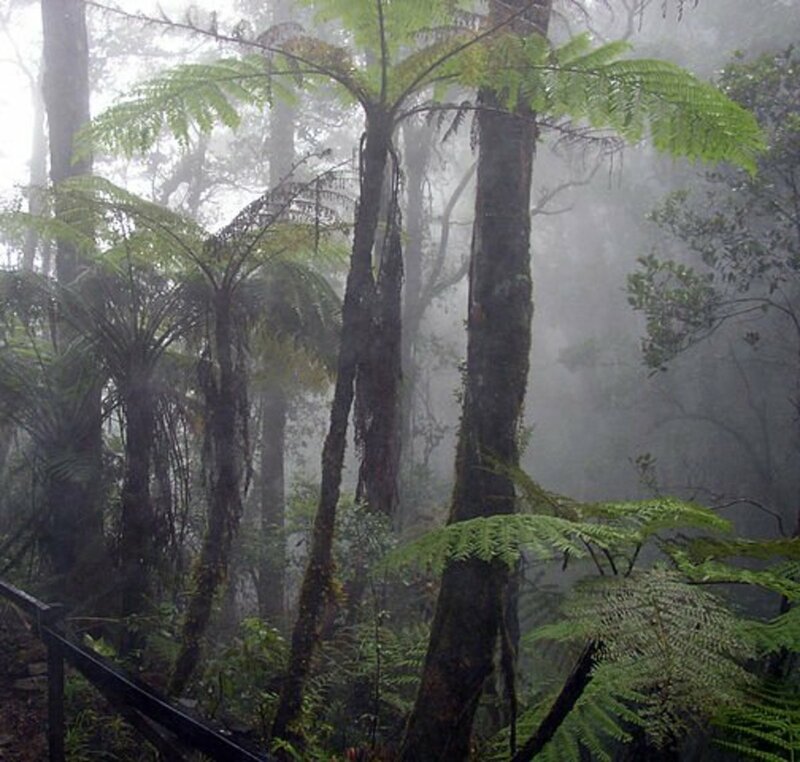 There they are believed to occur in a montane cloud forest characterized by evergreen plant species and a perpetually moist climate. Not only is the butterfly endangered, but this entire ecosystem is threatened by development and climate change. It's possible that the biggest threat to the Luzon Peacock is not people with nets but instead people with cars -- the exhaust from millions of vehicles could be the death of fragile areas like the Phillippine Cordillera Central. It is truly ironic that, according to the IUCN website, "conservation efforts have been inhibited by the lack of research on the species [and] outdated surveys of the butterfly’s population... 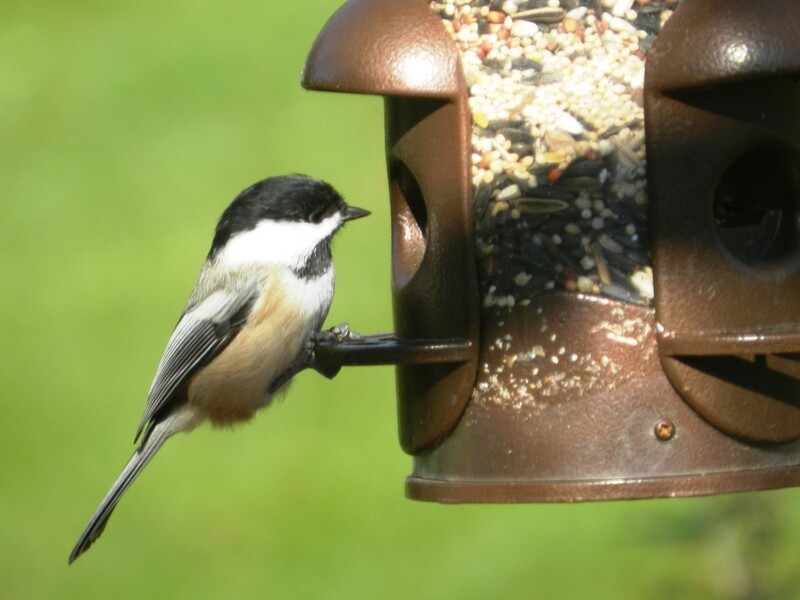 The lack of information on its biology hampers suggestions on effective conservation plans." 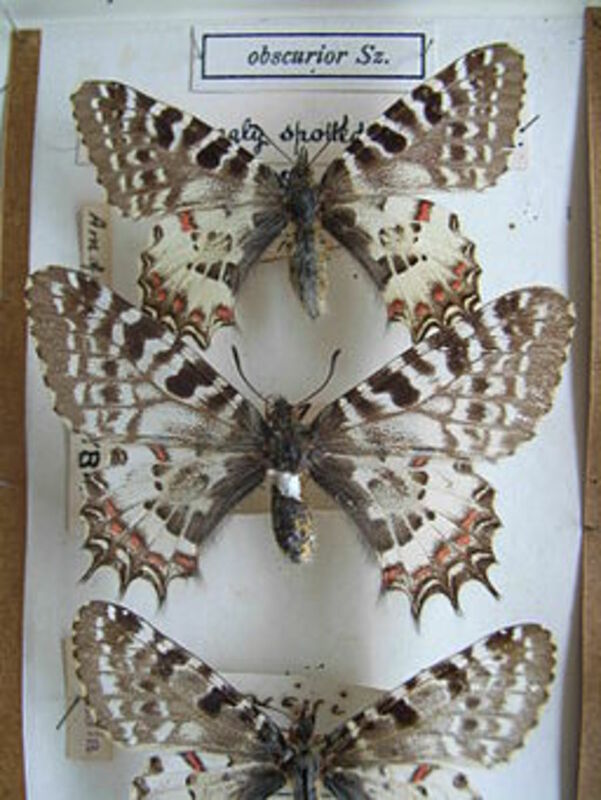 The irony stems from the likelihood that restrictions on collecting are causing the "lack of information" that "hampers" scientists' ability to effectively study and learn about butterflies like the Luzon Peacock and others. This great insect is the largest swallowtail butterfly in the Western Hemipshere, and one of the largest butterflies in the world. Its enormous, strong wings would just about cover a dessert plate. 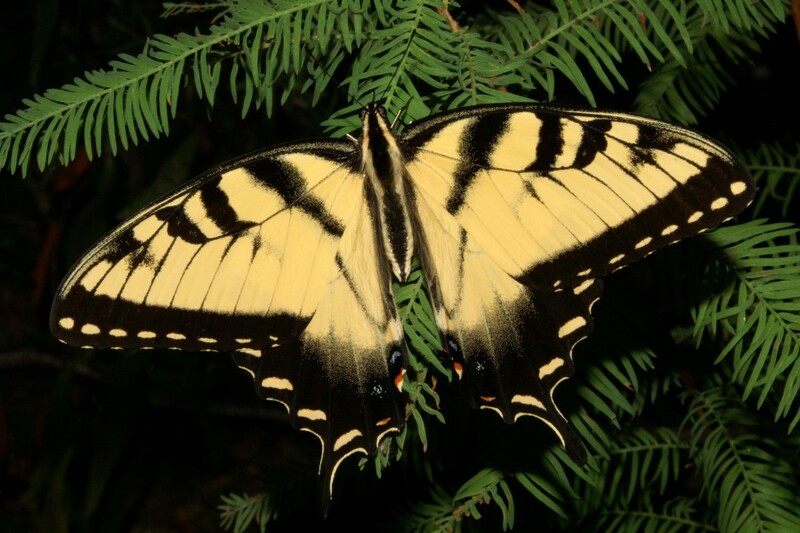 The Homerus Swallowtail, named for Homer Simpson, is...wait a minute, that's not right. It was named instead for the Greek poet Homer, and such an epic insect does indeed deserve such an epic namesake. 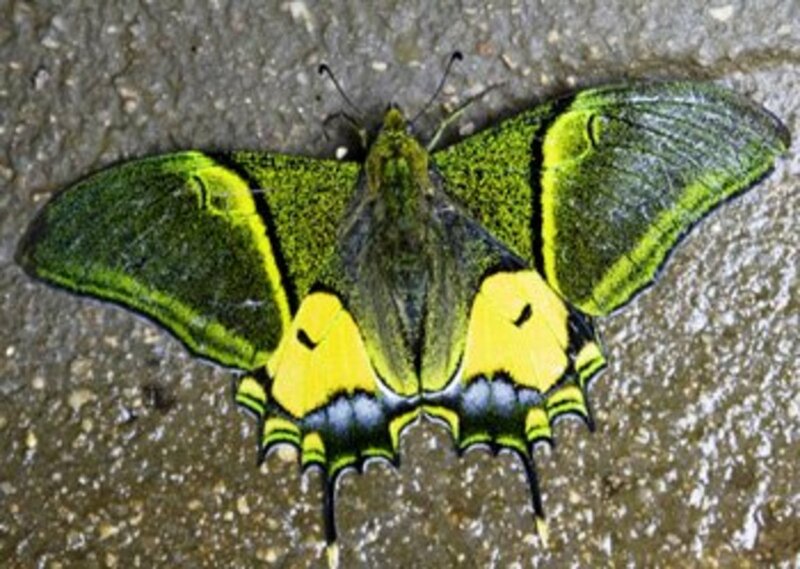 The Homerus Swallowtail lives in small areas of the mountains of Jamaica, where it has the full protection of CITES and the Jamaican government. 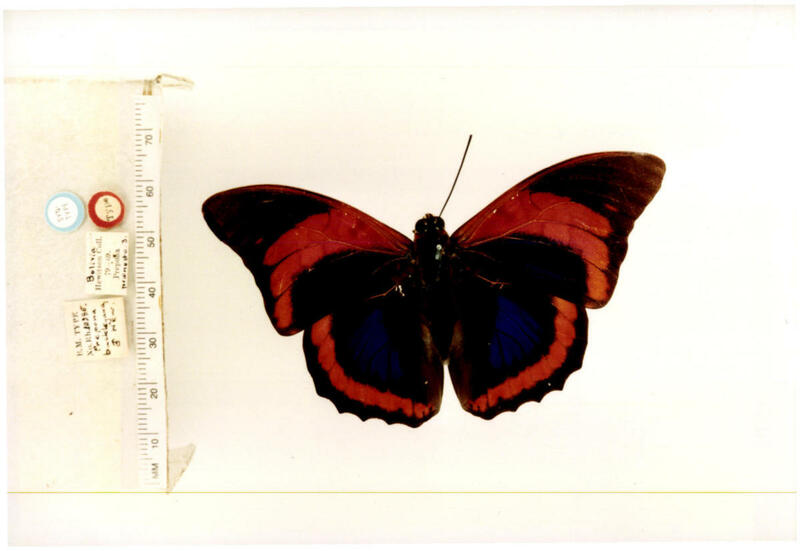 To catch or otherwise remove a specimen of Papilio homerus from its jungle home without a permit for scientific study is to risk heavy fines and possibly a stretch in a Jamaican jail, not to mention making you a pretty dishonorable human being. One reason P. homerus is having such a rough time is the fact that its early stages are highly vulnerable to attack by a parasitic wasp. Many insects of all kinds are attacked by a variety of parasites, and in some cases the parasites are so successful that the host species nearly dies out. That has been the case with the Homerus Swallowtail, which is the victim of attacks by a tiny wasp that lays eggs on the caterpillar as it feeds. The tiny eggs hatch, the tiny wasp larvae burrow under the big caterpillar's skin, and the die is cast -- within a few weeks, the wasp larvae will be full grown, having eaten the fat stores of the living swallowtail caterpillar. The caterpillar dies, the larvae turn into adult wasps, and the cycle continues. In some species the only thing that inhibits the continued success of the parasite is the difficulty in finding a healthy host caterpillar to attack. Though at least one source claims that Papilio homers has been pushed to the edge of extinction in part due to pressures from over-collection, the general consensus is that habitat loss and the development of primary forest in Jamaica have been the most destructive forces. In fact, as noted elsewhere in this guide, there are valid questions about insect collecting and whether that activity can truly drive rare or endangered species like the Homerus Swallowtail into extinction. Experiments and anecdotal reports offer conflicting information about whether collecting alone can wipe out a species. One the one hand, there are a couple of instances in which a colony of a rare insect was eliminated by collectors -- not scientists or people doing valid research, but profit-minded collectors -- but in at least one case the colony repopulated after a period of time. But was the insect was not driven to extinction by the collectors alone? The effort to remove an entire species from its entire range by net collecting would be geographically and practically impossible. Another experiment suggested that even in one limited parcel of habitat, it would be nearly impossible for humans to completely eradicate a species. An experiment carried out some time ago with a colony of checkerspot butterflies in the United States appeared to show that no matter how often or how intensively a team of researchers collected, they failed to extirpate every individual of the target species. Part of the reason seemed to lie in good old natural selection. Since the visible, easily-caught ones were taken out, the secretive, hard-to-find individuals were left to interbreed, creating more hard-to-find butterflies. The activities of the researchers essentially recreated pressure from a capable but not unbeatable predator, and the butterflies best equipped for survival lived to reproduce. Evolution in a nutshell! Surely one of the world's most gorgeous butterflies, Teinopalpus aureus also sports one of the most inharmonious common names out there: "The Golden Kaiser-i-Hind." Don't ask me; I don't know. The shimmering greens, golds, and purples of the large swallowtail have made it a favorite among collectors. The closely related T. imperialis is every bit as beautiful and is also rare and protected against collecting. Like many very rare and endangered insects, the early stages of Teinopalpus aureus are poorly known. The larvae is said to feed on Daphne nipalensis, a type of rhododendron, but descriptions and images of the caterpillar are nearly impossible to find. Without more information about the life history of species like T. aureus, conservation efforts face a nearly impossible task. Sending certified, responsible researchers and collectors out to document this and other rare species will give conservationists what they need to proceed: hard facts, legitimate records, and evidence of early stages. An observer over a hundred years ago reported that the Kaiser i-hind "is only found in the forest region from about 6,000 to 10,000 feet, and it is most difficult to capture on account of its remarkably strong, rapid and dashing flight, and its habit of resting on high trees from which it flies only during a few hours of the morning" (Elwes, Trans. Ent. Soc. 1888, p. 421). The cryptic colors of the insect's underside mean it can "hid in plain sight." Some reports claim that this butterfly is so reliant on holding still and blending in that it can be easily approached and even picked up by hand while sitting on foliage. 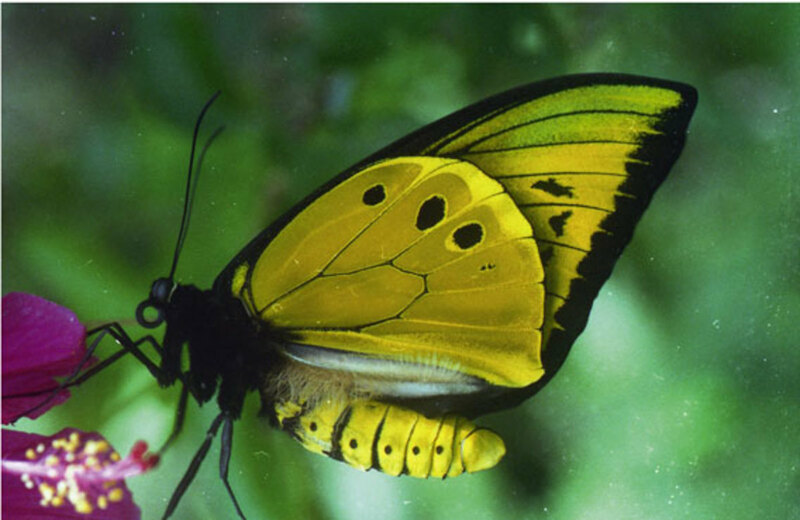 This jaw-dropiing butterfly belongs to the group of swallowtails known as "birdwing butterflies." This group includes the world's largest butterfly (Queen Alexandra's Birdwing, Ornithoptera alexandrae) as well as some of the rarest. 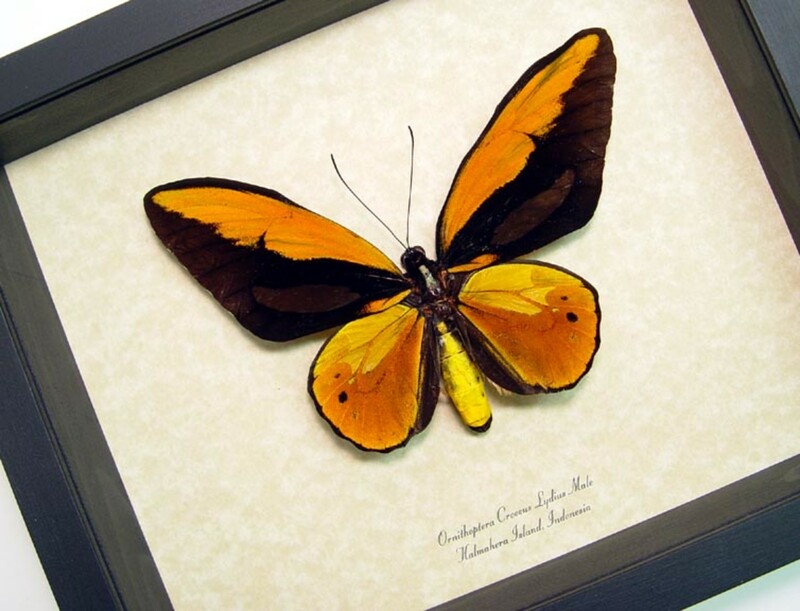 All birdwing butterflies are protected against habitat damage and collecting, but some are "farmed" to provide perfect specimens to those who desire to assemble a hobby collection. A "mimic" is an organism that has evolved to look a lot like another organism, in order to gain an edge in the process of natural selection. If you look like something poisonous or dangerous, the theory goes, you just might be passed over by a hungry predator. For example, the monarch butterfly (scientific name Danaus plexippus), as a larva feeds on various species of milkweed (genus Asclepias). "Milkweeds" are called that because of their milky sap: if you break off a leaf, you can watch the milk-white sap well up and even run down the stalk. That white sap is poisonous to most animals and many insects, so very few things eat milkweed. 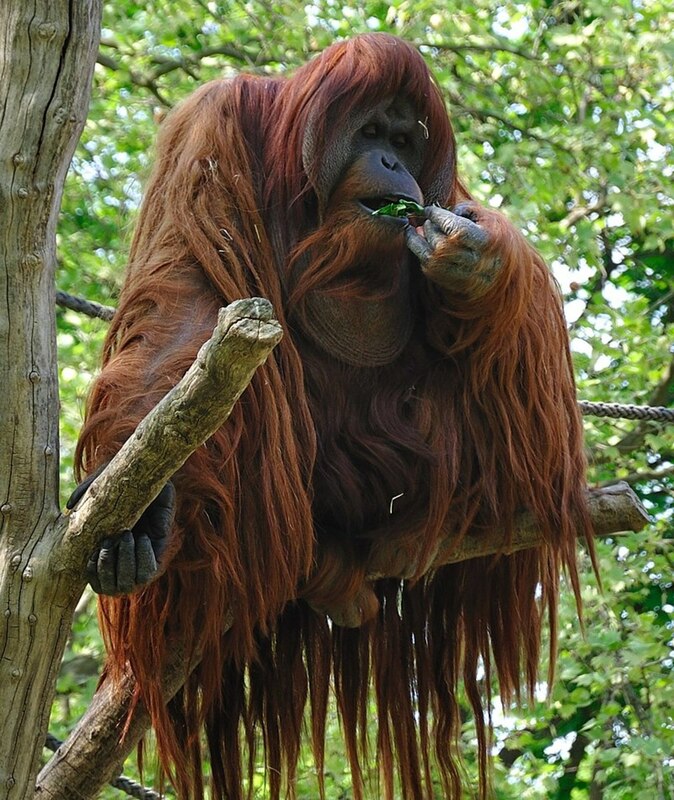 D. plexippus, however, is able to not only eat the leaves, but also retains some of the poisonous compounds from the milkweed into their tissues. This is easy enough to show with a lab tissue analysis of monarch caterpillars: the toxic milkweed alkaloids are present in the caterpillars. The toxins persist into the adult stage, and as a result, each and every monarch you see flying around is protected by being a little bit poisonous. Studies in which adult monarchs are fed to birds show that the birds react very negatively to the experience. They drop the insect with minimal damage and often can be seen wiping their beaks on a branch, evidently trying to get the taste out of there mouth (or out of their beak, I suppose). Monarch butterflies are an excellent example of what biologists call "aposomatic" coloring. They're bright orange and black, which in the animal world is a kind of universal color code for "stay away -- I'm poisonous, or I sting, or both!" Predators have learned behaviors that lead them to be very wary of eating these brightly colored insects and animals. Species all over the world, from monarchs to poison-dart frogs, use aposomatic coloring to advertise the fact that they're protected. The bright orange and black of the monarch may be considered pretty to you or me, but the real purpose is to be as visible as possible to birds and frogs and anything else that might eat it. Orange and black, yellow and black, and red and black are perhaps the most common warning colors in the animal kingdom thanks to the sharp contrast. Humans use it too -- consider that street repair signs and hazard lights are typically some combination of these colors. Everywhere you go, these colors mean the same thing -- watch out! You may be wondering what the monarch's protective coloring has to do with mimicry. 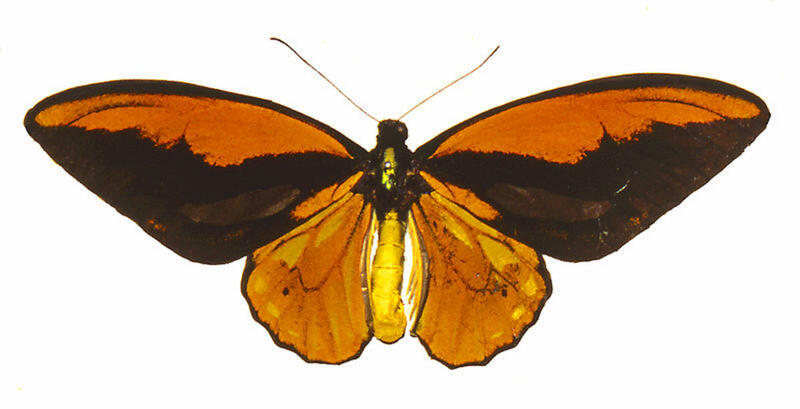 It becomes clear when you consider another butterfly species, Basilarchia gilippus, also known as the viceroy. The viceroy isn't closely related to the monarch, but it's a nearly perfect copy of the monarch's pattern. 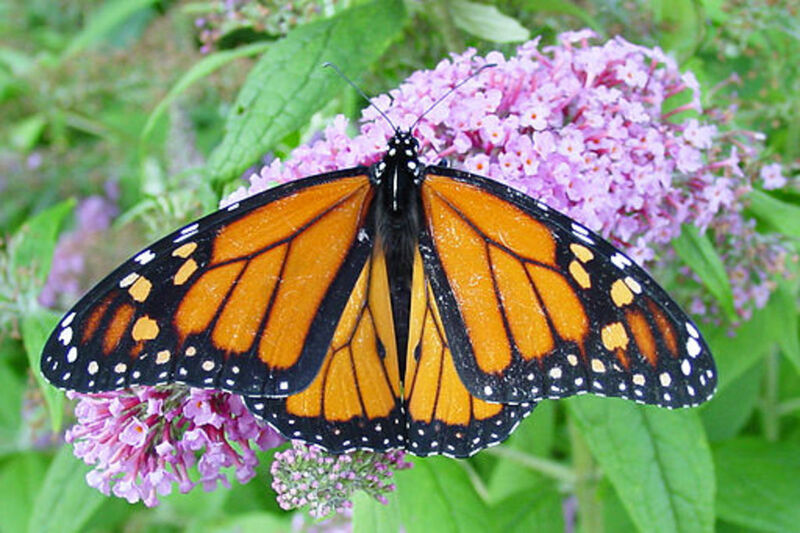 The butterflies that are related to the viceroy look nothing like the monarch -- they're all dark blue and brown. It's almost as if one member of a family came out looking completely different from all his brothers, but exactly the same as the next door neighbors. People might start to talk! It turns out the viceroy/monarch relationship is an example of what's known as "Mullerian mimicry," named for Fritz Muller, a 19th-century biologist. For a while it was thought that the viceroy was edible, and was copying the monarch to fool predators (a relationship known as "Batesia mimicry"). Recently, though, it was found that the viceroy is also poisonous. 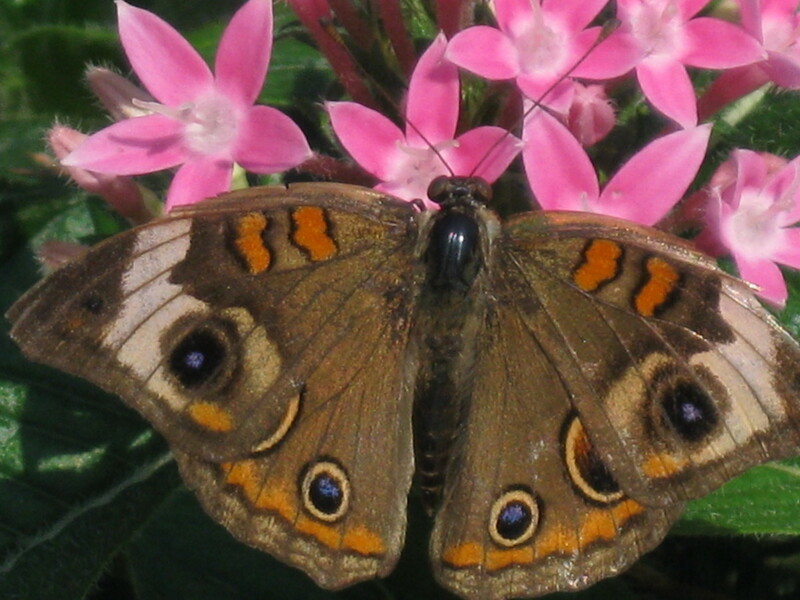 By looking similar, the two butterflies let predators know that they're both nasty and shouldn't be sampled. Here's a photo of the two species so you can see the beauty of the insects and the completeness of the mimicry. The viceroy is on top. Which of these Butterflies is Your Favorite?